The stylish C-class-based Mercedes-Benz GLC SUV was launched last year and we loved the car when we drove it. It was high time that Mercedes-Benz had a competitor in that segment which till date was only captured by the likes of the Audi Q5 and the BMW X3. It was in August last year, that we first got a chance to see and drive the GLC Coupe SUV and that one caught our attention. In fact, we were told by the folks at Mercedes-Benz that the GLC Coupe will come to India with one more variant. Sadly though we only get the AMG and even though I began this sentence with ‘sadly’, I am not the one to complain. The GLC 43 Coupe is the third AMG model to be launched in India this year and the fourth to be added to the 43 series AMG line-up. First unveiled in 2015, the GLC Coupe is distinctively different than the SUV. It’s sportier, yes, but one look at it and you’ll know the obvious reason. The signature coupe-rear, makes it stand out amongst the rest but if you aren’t one who can stand that design, well you can’t do much about it; the coupe SUV is here to stay. In typical Mercedes-AMG fashion, the GLC43 Coupe is still quite similar to its non-AMG counterpart. But, it does get the standard AMG treatment which does help it to stand out a bit. I feel like normally we see a slightly different fascia on AMG models, but with the GLC43, that isn’t exactly the case. The fascia is the same, but the trim has changed a bit. The corner vents still feature the same black mesh, but now have a pair of horizontal slats running across the inside. That weird silver trim that surrounds the air dam on the non-AMG version is gone and the air dam now has a single horizontal slat positioned about an inch from the bottom of the fascia. A new trim element now runs across the entire width of the fascia on the bottom. It still features those square cutouts below the air damn, but they are outlined in that silver trim. The edge of that trim element is finished in chrome. The headlights and hood are the same, but the radiator grille now has the typical AMG diamond look. Moving over to the sides, there really isn’t any major changes to the GLC43. Compared to its non-AMG counterpart, the only real difference is the chrome trim that has been added to the side skirt which lines up with the chrome strip on the fascia up front. The big news here is that new set of high-sheen, 20-inch AMG wheels finished in high-gloss black. These light allow wheels feature a staggered fitment and are wrapped with 255/45-series tires up front and 285/40-series tires out back. There are other wheels available as optional equipment with the maximum size reaching as much as 21-inches. On a side note, the wheels shown in the images here are way more stylish that the stock wheels on the standard GLC Coupe. Around back, Mercedes claims the GLC 43 has an AMG-specific rear bumper. What they really mean is that the rear fascia has been fitted with a chrome trim insert below the license plate recess. There are also chrome exhaust tips that sit flush with the rear bumper. Like most AMG models, these chrome tips are divided in the middle by a vertical louver to give a dual-outlet look on each corner. And there you have it. There’s not really a whole lot of difference outside, but it’s enough to separate the boys from the men as some say. Typically Mercedes and finished off to a high order, it gets all the familiar bits like the seat-shaped electric seat controls, the rounded steering boss and the controller dial semi-encased by the trackpad. Sadly, there’s the stuck-on display screen which seems like an afterthought, and the steering stalk gear selector, both of which I am no fan of. Being an AMG, it means you also get sporty black interiors with red stitching and red seat belts. There is also a flat-bottomed steering wheel with paddle shifters, and black and grey chequered patterned dials. Comfort-wise, the front seats are great but quite large for my thin frame. This meant that the side bolstering couldn’t hold me as snugly as I would have liked in the fast twisty bits. With the sloping roofline, space at the back isn’t exactly great but headroom is sufficient; my 5ft 8in frame had about a three finger gap to the roof that is scooped out for the outer two passengers. Width and legroom leave you with nothing to complain about, but the narrow rear windows do make you feel cooped up. Another area that the sloping roof line eats into is boot space and what worsens this is that the space saver spare sits on the high floor making it a choice between weekend bags or wheel. Oddly though, there is quite a large under-floor storage, but in the form of divided sections that sadly won’t take the spare wheel or a large suitcase. Under the hood, you’ll find an “AMG-enhanced,” 3.0-liter V-6 that delivers 364 horsepower and 384 pound-feet of torque. Boost pressure for the Biturbo system has been increased to 16 psi and, as usual with AMG engines, the cylinder liners are coated with NANOSLIDE. Fuel pressure on this model is wild at 2,900 psi. The engine features a red aluminum insert on the engine and the AMG Logo. Shifting duties are handled by an “AMG-enhanced” 9G-Tronic nine-speed automatic transmission. According to Mercedes, the transmission has been configured with dedicated software to reduce shift times, provide multiple downshifts for quick bursts of speed, and to provide a double-clutching feature for more emotional and quick gear changes in certain transmission modes. Supporting the body on this funky little AMG is an AMG Sport Suspension based on air body control. Up front, the car gets special steering knuckles with load-bearing joints. Out back, there is a multi-link system that is said to, in combination with the negative camber up front, provide enhanced lateral dynamics. The system is of the multi-chamber type and features continuously variable damping and lightweight springs. With a fording depth of 11.8 inches, an approach angle of 21.2 degrees, and a departure angle of 21.8 degrees, AMG wants you to know that this “coupe” has strong off-road capabilities. It’s also able to tow, with a braked towing capacity of up to 3,501 pounds when properly equipped. This vehicle comes standard with the 4MATIC all-wheel drive system that has a rear-biased torque distribution. Basically, 31 percent of torque is delivered to the front wheels while 69 percent goes to the rear. More importantly, the car comes with selectable transmission modes. There is Eco, Comfort, Sport, Sport+, and Individual; the latter of which is driver adjustable and can be dialed in just the way you like it. There’s also an “M” button that enables a manual-shifting mode. In this mode, the transmission is controlled by the steering-wheel-mounted shift controls. All four wheels are driven and the Coupe 43 gets an AMG-specific power distribution that puts a larger percentage of power towards the rear but the car does tend to lean towards understeer when pushed. The steering has a nice and weighted feel but even in Comfort mode some would find it on the heavier side for simply meandering about traffic. It’s also over-assisted at times. The GLC SUV has a well-rounded suspension and even the steel-sprung regular coupé that I sampled in Italy had a nice balance of ride comfort and sporty handling. However, this being an AMG, it’s set up a bit firmer. It does get air springs all round but the ride is on the harder side and rough surfaces feel loud and rumbly. The upside to this is a very stable body, there is no getting away from the mass, but it rolls far less than you would expect of an SUV this large and heavy. The air springs also allow you to raise the ride height of the body should you need the extra clearance. The Mercedes-Benz AMG GLC 43 Coupe braking system feature ventilated disc brakes with AMG calipers, antilock brake system with electronic brake force distribution, and brake assist system. The strong build quality of the body designed to withstand high collision impacts and the surround protection of the occupants are assured with seven airbags including front, front side and curtain airbags, and the knee airbags for the driver. The active parking assist system with Parktronic technology and 360-degree camera with audio and visual display function assist for safe parking of a vehicle and the adaptive brake lights get the spontaneous attention of the following vehicles for keeping a safe distance during high-speed driving. 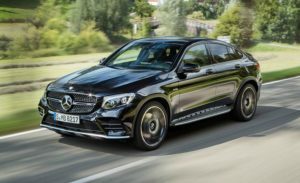 Overall the GLC 43 Coupe provides the fun and ride of a sports coupe with some of the practicality and looks of an SUV. It looks and handles a lot better than most other sporty SUVs like the Audi SQ5. At the same time the practicality is a bit limited due to the dropping roof line both in terms of rear passenger space as well as driver visibility.The Mercedes-AMG GLC 43 Coupe is a very good looking sporty cross over between a SUV and a Coupe. It handles way better than you would expect and it clearly has a lot of AMG DNA. The V6 provides a solid sound track and a lot of fun on some of the empty mountain roads we drove. On the downside it is a bit thirsty and the coupe design provides some drawbacks in terms of visibility and available space.